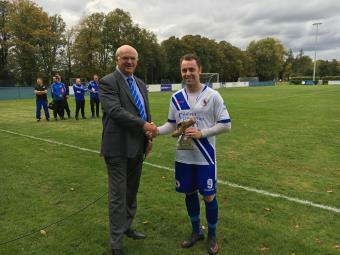 1st Team striker Pete Williams was presented with his trophy at Saturday’s game for his magnificent achievement of scoring 100 goals for the side. With a hat trick on Wednesday night, against Holland’s and Blair, he took his total to 102 Goals in 140 games. Well done Pete from all at the club.